We take many place names for granted in Britain, but if you investigate a little, you tend to come up with some surprises. Croydon is one example. The name is believed to be derived from the Anglo Saxon for crocus valley. Apparently Croydon was once used to grow saffron for medicinal use. You see, you never thought about that before, did you. You probably also never considered that you don’t have to follow convention when you are planning a corporate event. It’s time to think less of conventional Croydon and more of hog roast Croydon. Hog roast Croydon? What has that got to do with corporate events? Well, in the recent past, not a lot. But go back to medieval times and hog roast was a big deal. You could say that hog roast was one of the very first corporate meals because these medieval feasts were as much about impressing the decision makers as they were about eating good food. Really, nothing has changed. But for some reason hog roast slipped off the Croydon corporate radar and instead, chicken, lamb and beef dinners became the regular meals at these events. But hog roast Croydon is changing this. Hog roast is making a comeback and is helping to transform corporate event catering in Croydon and the UK. Hog roast will impress your business associates from the very first moment they enter your venue. When the aroma of freshly roasting hog roast hits them, you are already on your way to winning team over because the aromas are something else. But that’s just the start. The hog roast chef is not a shy character, so he likes to do his roasting so that everyone can see him in action. 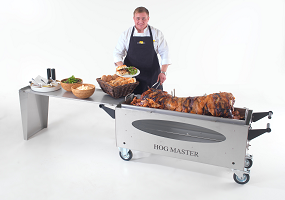 The hog roasting machine is an eye catching piece of machinery that can help form the centrepiece of your event. Upon the hog roasting machine is the whole pig slowly roasting away – and it is slow. The whole hog takes six hours to cook, helping to produce that all important range of wonderful flavours unique to hog roast. This is all impressive stuff for your Croydon guests: great aromas and a fantastic to look at fresh roasting whole pig. What more could they possibly want? Well, how about an incredible plate of food? Hog roast may have something of a reputation as a free and easy party food served on rolls, but there’s another side to hog roast; a sophisticated, formal side. Your Croydon hog roast chef can carve your hog roast joint so that it can be presented as beautifully as the finest plate of food you will find. Add all the trimmings including apple sauce and crispy crackling and you have a plate of food fit for a king, queen…or important client! And need I say that hog roast tastes simply delicious? Unbeatable, unmatchable flavours that will bowl over all who taste it. Just like Croydon’s name, there’s more to it than you originally thought, which is a little like hog roast too.